The Tropical Butterfly House, Wildlife & Falconry Centre has been recognised for their work in PR, Marketing, Digital & Events at the British and Irish Association of Zoos and Aquariums 50th Anniversary awards ceremony. The British and Irish Association of Zoos and Aquariums turns 50 this year and representatives from its membership came together to celebrate the past and consider future challenges at a major conference held at Marwell Wildlife, Hampshire, which ran from 6 to 8 June. Culminating in a gala dinner and awards ceremony on Wednesday evening, the Tropical Butterfly House was recognised for their PR, Marketing, Digital & Events efforts. The award was given to the Tropical Butterfly House for their improved digital presence and online customer experience including social media pages, the Tropical Butterfly House website, and reaching the number 1 ranking on TripAdvisor. Louise Larcombe, Marketing Manager at the Tropical Butterfly House, said “We are thrilled to receive this award, a lot of hard work has been put in to improving the centre’s digital presence therefore it is a great morale boost to receive this recognition. Marketing Manager Louise Larcombe also received a commendation for a behind the scenes photo taken of an endangered African White-backed Vulture being trained by Animal Team Leader Abigail Carter. 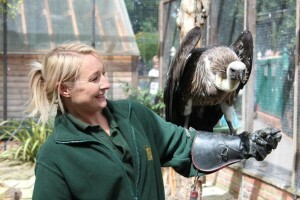 The Vulture, named Zulu, can now be seen in many of the twice daily Animal & Bird Displays that take place at the wildlife centre. Originally known as The Federation of Zoological Gardens of Britain and Ireland, BIAZA was formed in 1966 out of recognition of the need for standardised principles and practices in animal management. Made up initially of just nine zoos and bird gardens, the Association has grown over the past 50 years and today its 113 strong membership have become a powerful force for conservation and education, with continuous scientific research and sharing of best practice to ensure the highest levels of animal welfare.